Ensure that fingers or articles of clothing do not get caught in moving parts when performing this test. (a) Check the LO operation. (1) Connect a battery positive (+) lead to terminal 5 (+1) and a negative (-) lead to terminal 4 (E), and check that the motor operates at low speed (LO). Motor operates at low speed (LO). (b) Check the HI operation. 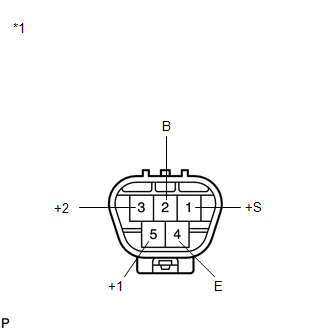 (1) Connect a battery positive (+) lead to terminal 3 (+2) and a negative (-) lead to terminal 4 (E), and check that the motor operates at high speed (HI). Motor operates at high speed (HI). (c) Check the automatic stop (park) operation. (1) Connect a battery positive (+) lead to terminal 5 (+1) and a negative (-) lead to terminal 4 (E). With the motor operating at low speed (LO), disconnect terminal 5 (+1) to stop the wiper motor operation at any position other than the matchmark. (2) Using SST, connect terminals 1 (+S) and 5 (+1). Then connect a battery positive (+) lead to terminal 2 (B) and a negative (-) lead to terminal 4 (E) to restart the motor operation at low speed (LO). (3) Check that the motor stops automatically at the automatic stop (park) position. Motor stops automatically at the position. 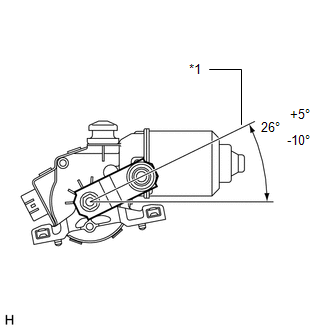 If the result is not as specified, replace the windshield wiper motor assembly.